I was a little apprehensive about going to a show at the Royal Albert Hall. For some kinds of music the acoustics are terrible and despite all their best efforts, I suspect they always will be as the building just wasn’t designed to handle the kind of amplification we expect these days. But what the heck, I wasn’t going to pass up the chance to see the Four Tops and the Temptations live on stage for the first time in 30 years. The Temps success was always based on the mix of lead vocalists, every one of them taking a turn and they still stick to this format, which is a joy. They ran through a set of 16 numbers which included all their big hits. We were treated to ‘Ain’t too proud to beg’, ‘Ball of Confusion’, ‘Just my Imagination’ and ‘Papa was a Rolling Stone’ in quick succession before being given an introduction to the band. Then it was into ‘Get Ready’, ‘Stay’ and ‘Treat Her Like A Lady’; the men having been instructed to listen closely. It was then that my mystery was solved. GC explained that Harry McGilberry is ill and under orders from the Doctors to stay off the tour. The group are trying out Joe Herndon and he was offstage singing along, hence the disembodied voice. Joe came out for a brief dance which looked pretty good to me and having heard him sing, I think he’ll fit in just fine. GC added that due to their huge numbers of hits, they were unable to sing everything that we would like as they’d be there till Christmas. I doubt if anyone in the audience would have minded staying there till then but, to make sure we got a taster, they launched into a medley of ‘The girl’s alright with me’, ‘All I need’, ‘It’s Growing’, ‘Beauty’s only Skin Deep’ and ‘Don’t look back’. The crowd had been on their feet dancing along to most of the fast numbers and swaying to the slow ones but as the opening bars of ‘My Girl’ rang out, 5,500 people found their voice and sang along to the entire song. Spine tingling stuff! Lights down, Loads of dry ice ‘smoke’ and on came the Tops. Four of them as you’d expect, wearing mirrored jackets that flashed and sparkled like crazy. Renaldo Benson and Abdul Fakir, the two originals, were joined by Theo Peoples and Ronnie McNeir. 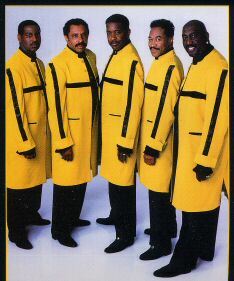 Theo, an ex-Temptation, was brought in to replace Laurence Payton who sadly died in 1997 and Ronnie was covering for Levi Stubbs who is seriously ill after a stroke and prostate cancer. Whereas the Temps had a basic stage setting, with good lighting but nothing too flash, the Tops went all out for a spectacle. The guy on the lights must have been working his little socks off, which was probably just as well as this is where the poor acoustics really kicked in. Whether the sound settings were changed during the break or whether the Tops style caused different vibes I have no idea but their opening number, whilst I stood and danced to it, I couldn’t actually tell you what it was. They went straight into ‘Bernadette’ but the arrangement was odd and it didn’t have the same impact. We were then introduced to the band, some of them for the second time as they use many of the same musicians as the Temps. There was quite a bit of banter going on but much of it was inaudible and you could see they thought we weren’t responding. Then we were off into ‘I Can’t Help Myself’ which had the crowd up dancing and singing. Inexplicably, having got us all up, they then dropped the tempo for ‘When she was my girl’, ‘Ain’t no woman like the one I got’ and ‘Still Water’ and we all sat down. We stayed down for a medley of really old Tops songs and it was explained that next year is their 50th in the business. After a bit more unintelligible banter we got renditions of ‘Baby I need your lovin’ with the 5,500 voice accompaniment again, ‘Reach Out (I’ll be there)’, and ‘Keeping up with the Joneses’ to which we were asked to sing the chorus, and did. I don’t want to give the impression that the line-up is not good. Ronnie and Theo are fantastic but they are not Levi and Laurence and I think this is where the Tops lost out over the Temps. The Temps have always switched vocalists with every number and are therefore not associated with any one sound, but The Tops were Levi Stubbs and without that distinctive voice they are a now good tribute band. 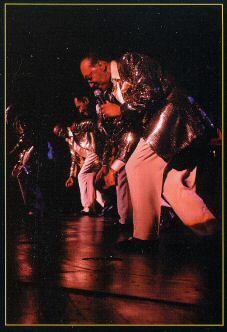 The finale was a fantastic rendition of Heatwave’s classic ‘Always and Forever’ by Theo Peoples. That man can sing! But I was left wondering why they chose that rather than any number of their own songs that they had missed. ‘Do what you gotta do’ being one glaring example. I know it was never a hit in the States but it was huge over here. Throughout the evening I had been getting more and more irritated by a woman sitting at the side of the stage who kept calling the performers over, kissing their hands and making dramatic gestures all through their set. She, plus the other two ladies at her side looked familiar but it wasn’t until the lights came up that I realised it was Sister Sledge. Ladies, you are great in your own right but you were not on the bill.